The Supra is part of Selle Royal's new Performa line up, a range of saddles split into three different categories depending on the style of riding you do. It's a concept we've seen other manufacturers follow to offer a more tailored approach to the rider. Part of the Anatomic category the Supra has been designed to have an elevated, anatomically ridged surface to relieve perineal pressure often associated with long hours in the saddle. Basically where your sit bones are positioned the saddle is higher while a central channel removes material from anything that doesn't like to be supporting your bodyweight. Additional to the channel is a central slot which will further remove pressure should you be crouched over for long periods, a kind of two pronged attack. Coupled with the design is the Supra's use of High P. Foam which is very supportive and almost hard to the touch. To be honest when I first tried pushing it in with my finger I didn't much fancy spending a couple of hours sat on it. It's designed to be load bearing therefore it only compresses a small amount keeping the saddle in shape while absorbing a lot of the road buzz and poor road surfaces. In use all three work well together as after a small acclimatisation period of a hundred miles or so the Supra was really comfortable without being squidgy. In fact it felt hard to sit on but every time I climbed off of it I didn't feel sore or abused in any way. Swapping it onto an ultra-harsh alloy frame with deep section wheels really showed the comfort levels as on the standard saddle I felt like I'd been kicked by a horse in comparison. At 144mm wide the Supra is a good 10mm wider than your typical race saddle though the narrow nose didn't cause me any issues with my thighs rubbing. 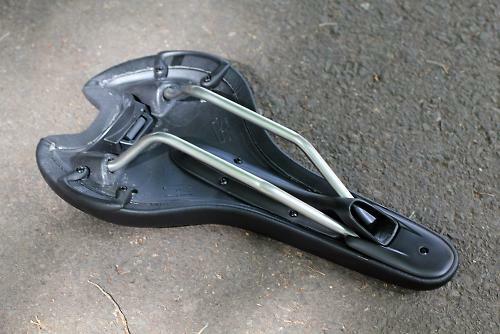 Don't get me wrong, I'm no Chris Hoy but it is an issue I have with some saddles. The length of 280mm provides plenty of room to move fore and aft should you like to move about over differing terrain. As Selle Royal's top end saddle the Supra uses their Secto rail which is a lightweight hollow tubular design and considering the size of the saddle and its padding the roadcc scales of truth showed a none too shabby 267g. Priced at £59.99 it looks pretty good value for money too. It's handmade in Italy and certainly put together well with no untidy edges of material sticking out. The plastic scuff guards should see it staying looking tidy too. Overall the Supra is ideal for road riders that have suffered discomfort or numbness as the firm padding really does keep your perineal area elevated from the saddle. The weight is acceptable and the hand finishing means you get a well put together saddle for the money. The Supra is designed for endurance riders that may suffer from discomfort or numbness after time in the saddle. The design seems to work well showing no signs of pressure at all for the rider. I certainly didn't suffer any discomfort from it and the design seems to make sense as there was no pressure from the saddle at all. A bit on the harsh side until the padding bedded in. £59.99 is a respectable price for a handbuilt saddle thats finished to this level and the design certainly seems to stand up to testing. If you do suffer from numbness or discomfort the Supra could well be worth a try.